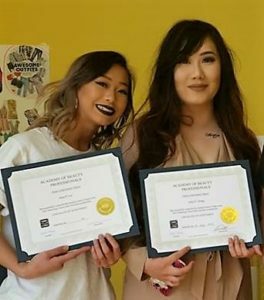 We asked two of Appleton’s most recent Nail Tech graduates, Anna Lor and Alica Xiong, why they wanted to become Manicurists – here’s what they had to say! Being a nail technician has always been a part of what I wanted to be when I was young. I always wanted to paint my siblings nails whenever I had the free time to do so. As I got older, I realized I fell more into makeup, and because I was more interested in doing makeup, I focused more on makeup than doing nails. I lost interest in nails. Because I’ve been doing makeup for almost ten years now on myself and family members, I already know so much. Then, I realized I wanted to go to school and become a nail technician. I knew there was more than just painting nails as a nail technician as well. Becoming a nail technician would also be more interesting because I didn’t know much about it. As I get closer and closer to becoming a nail technician, I’ve learned many things. Such as the safety hazards, bacterial infections, the three layers of the nails, etc. Although it’s been such a short journey throughout this program, I very much enjoyed it with my classmates, other students, and the instructors. Ever since I was little, I always dreamed of being a student in the beauty school program. I’m passionate about everything that comes with beauty – makeup, hair, and nails. As I grew up, my interest went more towards nails, and that’s when I wanted to start a career as a nail technician. I searched for a cosmetology school that had a nail program, and I found the Academy of Beauty Professionals, which matched my preferences more so than the other school we had in Appleton. One of the best decisions I made this year was signing up to join the nail program with ABP. Everyone at the school is extremely friendly, which makes new students feel more comfortable and makes it easier for everyone to get along. The school is always flexible with time and works with the best schedule for you. Not only that, but they also make learning so much fun every day because they’re not always all about the books all day, everyday. ABP has so many activities for us to do and we’re always actively involved in everything that we do. The instructors are always hands-on and are willing to help with anything that you don’t understand. I’ve learned and gained so much knowledge from the instructors. They gave me confidence and encouraged me to always strive to be better in everything I do. I wouldn’t be where I am now without the instructors by my side, guiding me to greatness with their kind words and knowledge. I know I will do great in my future career, and that’s all because of ABP accepting me as a student in their school. I would recommend the Academy of Beauty Professionals to anyone who wants to be part of cosmetology. It’s an amazing school with kind-hearted people, who are all so talented. Are you interested in starting a career in cosmetology? Learn about our programs here!